Generally I'm not one for "themed" food. But a girl's gotta have some fun. 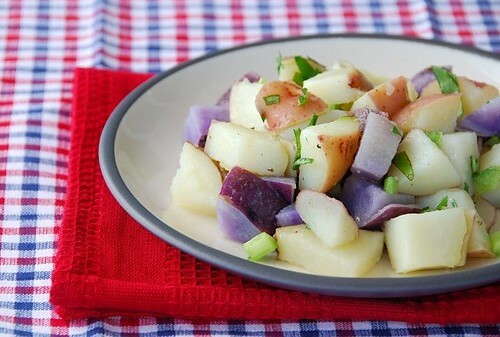 So for the 4th of July, I'd like to share a patriotic potato salad made with three kinds of spuds: old fashioned white russet, delicate red-skinned taters, and sassy All-Blue potatoes (which are sometimes labeled purple Peruvian). This potato salad is just kitschy enough without being tacky. Though I recommend using red-white-and-blue checkered cloths, I don't think sticking sparklers or miniature American flags in the potatoes is necessary. The potatoes you see here are called All-Blues. 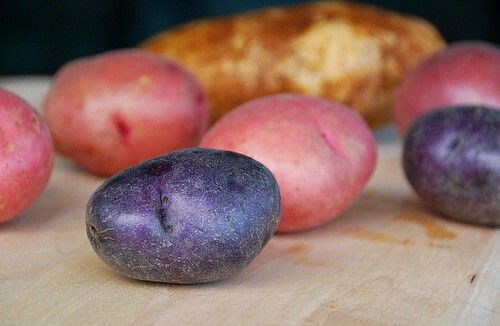 They are slightly starchier but the same color as purple Peruvians, which are technically fingerling potatoes -- smaller, thinner potatoes. Apparently, both get their brilliant color from iron. The color will fade when cooked, but try this trick to minimize the fading: add a couple of splashes of white vinegar to the cooking water. Scrub the potatoes well, rinse thoroughly, and pat dry. Cut into 1-inch pieces. Add to a medium size pan of water (with a couple of splashes of white vinegar, if desired). Bring to a boil; reduce to a simmer, and cook until potatoes are tender yet still firm to the touch, about 8-12 minutes. Meanwhile, whisk olive oil, white balsamic vinegar, water, herbs, salt and pepper in a small bowl, and set aside. **White balsamic vinegar is available at Trader Joe's as well as most major supermarkets. It's similar in flavor to regular brown balsamic vinegar but doesn't stain the potatoes. Susan, this is no more near the absurdity of "freedom fries" but a fitting spud salad for 4th of July. Enjoy the weekend and perhaps someone else will cook for ya! Love it! And guess what I'm writing about for BlogHer on Sunday? Potato Salad for the Fourth of July! Will love having this one to include with my list. i had heard of the blue potatoes, but the white balsamic is a new one for me...i'll look for it at t.j.'s. i love balsamic, but sometimes the dark color isn't right for the food, even thought the taste is wonderful! I love buying the peruvian blues whenever I can find them. I'm getting ready to make my potato salad today for my 4th menu on my blog. I can't quite make up my mind which direction I'm going. Thanks for all the potato salad links, too! lol, nothing wrong with kitschy! If I weren't trying to squeeze all of my ice cream posts into my line up right now, I'd also be posting red, white, and blue things. Seriously though, the potato salad looks really tasty though and is a nice change from the usual potato salads out there. Hats off to Trader Joe's, which sells multi-color baby potatoes all together in a little sack. Just perfect for this potato salad! Those purple potatoes are so pretty! And the salad looks beautiful with them. I can't get over it. Very nice! 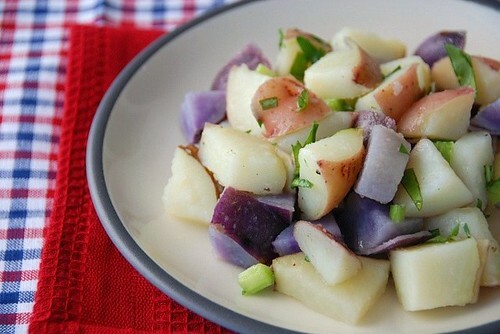 I love the color combination of potatoes and use it often, except I bake them. Waiting to see you American flag-shaped hamburgers. You are too clever! To be honest, I love kitschiness for holiday cooking. Happy 4th to you & your husband! White balsamic vinegar, how interesting! A gorgeous salad! Very pretty and colorful! Perfect! hey simply loved this one...as they say..you are the salt of the earth..na, in think, we should say that for potatoe too !! Lovely!.... and I LOVE fruit on salads, so your watermelon/green olive post looks sooo good! I'm definitely going to give those ingredients a try this month for my raw challenge! I'll link back to you when I do..
Love it! I'm endlessly fascinated by the new palatte of potatoes, and can't wait to see how your burgers come out! We are having a 4th cookout and I would love this but will probably just make a regular theme salad. Nice and simple! Happy 4th, Sweety! Happy 4th to you and Jeff Susan! Well, the potato salad will do for me. It looks loverly. I really like it Susan. i guess you're ready to celebrate the 4th of july! that's a great way to celebrate. Your salad looks yums. Your food are always so healthy Susan, that explains your great figure! Light, simple and tasty. Nice job! manggy-Freedom Salad! I love it! peterm-That sounds good to me! 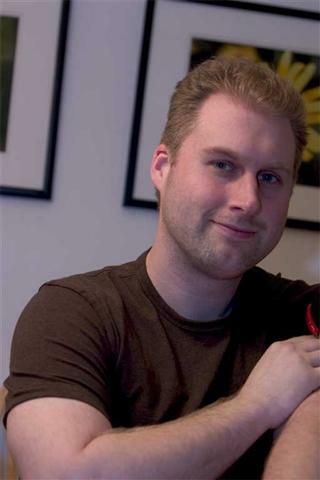 mike-Thanks! I'm glad you like it. simona-The colors are just so festive. 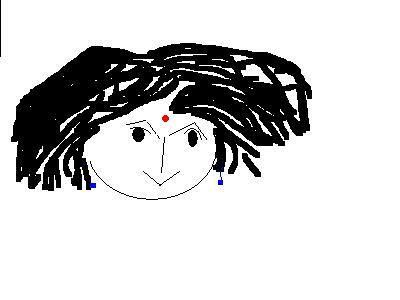 anamika-Oh, that's a nice thing to say. maryann-Happy 4th to you too! Hope it shines! stella-Well, that's awfully kind of you! Thanks. Beautiful! I love potato salads. This potato salad looks fab! A huge serving for me please. As a matter of fact, I'm going to go do it right now! Thanks for the link! 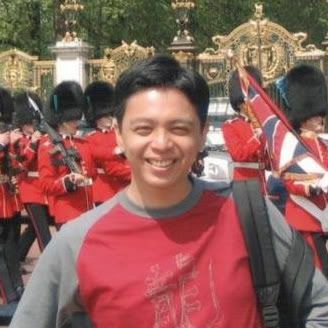 I love your photos and posts. LOL! Oh you make me laugh! I'm not much one for themed food either (that way lies madness...) but this is a subtle enough take on a theme - very clever!